A Workplace that can Move is a Workplace that can Grow. Our extensive experience and strong reputation has been earned over 30 years and allows us to equip your facility with the best-in-class lifting solutions. From the bridge to the hook, and everywhere in-between, we understand what it takes to move your goods. Acculift is the preferred lifting solution in Manitoba and Saskatchewan for workstation bridge cranes for manufacturers. What types of Building Cranes are there? Bridge workstation cranes are most commonly seen in manufacturing and industrial workstations (or work cells). Bridge cranes provide unrivaled reach and movement of your load. They are typically used in individual task workstations but can be extended to fill the entire facility. With modular designs, multiple hoist capabilities, and bolted floor columns, bridge cranes are extremely versatile and can be custom designed to suit almost any space and need. The most popular workstation crane as they are quick to install, expand, and can be relocated on concrete floors. A freestanding crane is the best possible solution for many worksites. They can be designed to be beneath overhead obstacles and existing cranes, they can provide crane coverage for most of the buildings floor space, and can be added onto as necessary. As they are bolted to the floor and not part of the structure of the building they can be moved or relocated as needs dictate. The number of columns and design of the freestanding crane is dependent on your lifting needs and the building itself. Freestanding cranes are the most versatile option available for lifting solutions. Here is one example case study of a freestanding workstation crane. and here is another. Easy to install with no floor space required, monorail systems are limited in terms of weight and reach. At its most basic a monorail crane system is a simple lifting device with one stationary beam that has a hoist and trolley. Due to its lightweight design, it delivers fast speeds for handling materials to specific locations. Monorails can be straight, curved, and integrated into other systems. 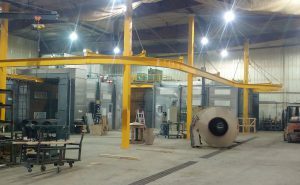 Ceiling hung or building mounted cranes have a great advantage as they require no floor space and they readily expand to connect to other bridge cranes or monorails. Not all building ceilings are designed to carry additional loads so an inspection would determine if a ceiling-mounted crane would be feasible in your existing facility. If the building is built for this purpose, very heavy loads can be lifted with a ceiling mounted crane. There are many applications of ceiling hung workstation cranes, see one in action right here. What configurations of overhead cranes are available? The two main configuration options for overhead cranes are top-running and under-running (or underhung). On a top-running crane, the end truck rides on top of the runway beam, for an under- running crane, the end truck rides on the lower flange of the runway beam or in the enclosed track system. Here is an example of a top-running crane. The under-running crane allows the hoist to get closer to the end truck or end of the runway than is possible when using a top running crane. Under-running cranes are usually more cost effective than top running cranes. If your operation calls for transferring hoists along bridges to interconnected monorails, you will need to make use of the under running style of overhead crane. A top running crane has greater headroom compared to the under-running crane. The other two configuration options for cranes are single girder or double girder; both could be used with either top running crane or under running cranes. Double girder cranes have greater support for higher capacities. Also, double guilder designs allow for a greater hook height than the single girder designs as the hoist could be fixed on top of the bridge instead of under it. Single girder crane has a lower cost but has lower capacities than double girder cranes. With a single girder crane, the hoist usually rides the bottom of the crane girder. There are many other options that have to be considered and are taken into consideration when designing a workstation crane – each making the lifting solution unique to your lifting needs. Below is a video from one of our partners, Gorbel, that showcases the considerations that we take when designing a crane system for a client. Our team has over 35 years of experience specifically in free-standing crane installs. Our services range from inspections, repairs, custom installs, solutions, to safety training for many brands of overhead cranes including Gorbel, EMH, and more. and let us help you select the right system for your job. We are Canada’s leading supplier of high-performance lifting solutions and air purification equipment, offering quick delivery and installation times backed by the industry’s best warranty. Contact us today to arrange a consultation, (204) 837 8367 or Toll Free at 1 888 317 8880. Want to see a bridge crane in action? We can show you!